Our itinerary for this weekend had us spending an evening at Ferrari World Abu Dhabi followed by a full day split between Motiongate and Global Village. This plan would have worked perfectly had my flight from Singapore to Dubai not been delayed by several hours due to a medical emergency on an earlier leg. Emirates kindly transferred me to an alternate leaving fifty minutes after my original departure, but it too ended up behind schedule after a passenger with checked in luggage went on walkabout. The net effect of this comedy of errors was that we didn't make it out of Dubai International in our rental car until two hours after what we'd expected to be the worst case scenario. It would have been just about possible to tick off our new credit even still, but paying full price admission for just ninety minutes of park time seemed like a very poor option. As such, we decided to put the two big parks today. The reshuffled routing gave us an impromptu lazy morning, as I'd placed our overnight hotel next to Ferrari World Abu Dhabi in order to minimise driving after a long day and time zone jump. The main park building was clearly visible from our hotel room window, though the intricacies of the road network made the actual journey considerably longer than it looked. Our scenic tour of Yas Island took almost a quarter of an hour, concluding at a multi-storey car park where we were the ninth vehicle of the morning. The park was nowhere near as empty as the lot might have suggested, though crowds were still very light; the longest wait during our visit was twenty minutes, and it'd likely have been half that if the operations had been less inefficient. As ever the day began with a front seat on Formula Rossa, which I'd argue to be one of the most effective ways to wake up in the known universe. Compulsory goggles provided protection from flying sand, but were entirely ineffective against the bright desert sunlight. I'd made the rookie mistake of leaving my polaroid lenses in the car, and the dramatic contrast between inside and outside left me with little choice but to ride with my eyes shut. Though I generally prefer to see where I'm going I'll admit to enjoying the sensation of speed as my face and upper body was sandblasted by the powerful winds, though the forces remain right on the edge of what I'd consider to be comfortable. We went for a second front seat ride later in the day after the sun had eased somewhat, though it was still necessary to squint; if anyone from the park is reading this, it'd be awesome if you offered optional darkened goggles during daytime hours. Our second stop was at Benno's Great Race, a dark ride that opened just two weeks after our last trip to the park in 2016. The experience is a mixture of traditional dark ride scenery and computer games along the lines of Maus au Chocolat at Phantasialand and the Toy Story Midway Mania attractions at the Disney parks. There were a variety of different games in the mix; one involved catching bees and putting them in jars; another involved cutting spider webs with a virtual scissors; another involved bursting as many pieces of fruit as possible. The standard of presentation was very good indeed, raising the bar not just for the park but for dark rides of this type in general. With that complete we made our way across to the new credit. 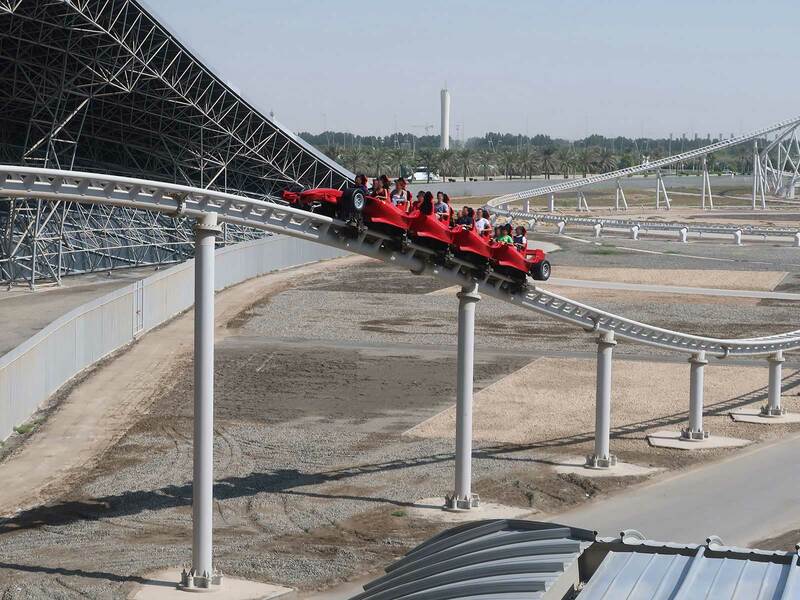 Turbo Track (#2398) has drawn a certain amount of scorn from the enthusiast community for its brevity, which many see as unbecoming of a major park like Ferrari World Abu Dhabi. The ride is a twenty second long launched shuttle that comprises a token airtime hill followed by a twisted vertical spike that pokes out into the sunlight through the middle of the park building. The cars seat twelve passengers in four rows of three, with the middle seats facing each other. We boarded backward-facing seats with no expectations at all, and ended up pleasantly surprised; though the experience is brief it is a lot more thrilling than the published POV video would suggest; the launch is powerful, and the view as the car ascends the spike is unmatched. Riders that face forward enjoy the former but not the latter; enthusiasts are advised to go for the backward facing seats if at all possible. Our next stop was at Bell Italia, a set of antique cars that I've never gotten round to doing before. The vehicles, which have no controls, are miniaturised versions of the Ferrari 250 California in subdued colours that move at slow speed past small scale replicas of Italian landmarks, including Portofino and the Amalfi Coast, the Monza race track, the Colosseum di Roma, Venezia, and the Maranello race track. The course also features a lengthy tunnel decorated with paintings of street scenes across the country. We had a throughly bizarre experience at Flying Aces. As with our 2016 visit guest throughput was on the far side of dismal, but in due course we were buckled into row five. The operators checked and double checked the train, then having done that began asking whether anyone would like to sit in the front row. We were never going to look a (prancing) gift horse in the mouth, and duly volunteered. For the next three or four minutes nobody seemed to have a clue what was going on, but eventually our seats were unlocked and we relocated into the front outside pair. Perhaps five minutes after that the recheck was complete and we were dispatched. The ride was every bit as good as I remembered, though I couldn't help but feel for the poor people behind the doors at the loading platform who must have waited at least a quarter of an hour for their turn. We were walking down the themed street next to the upcoming Mission Ferrari coaster just as some workmen entered, though sadly the door wasn't open long enough for us to have a peek inside. 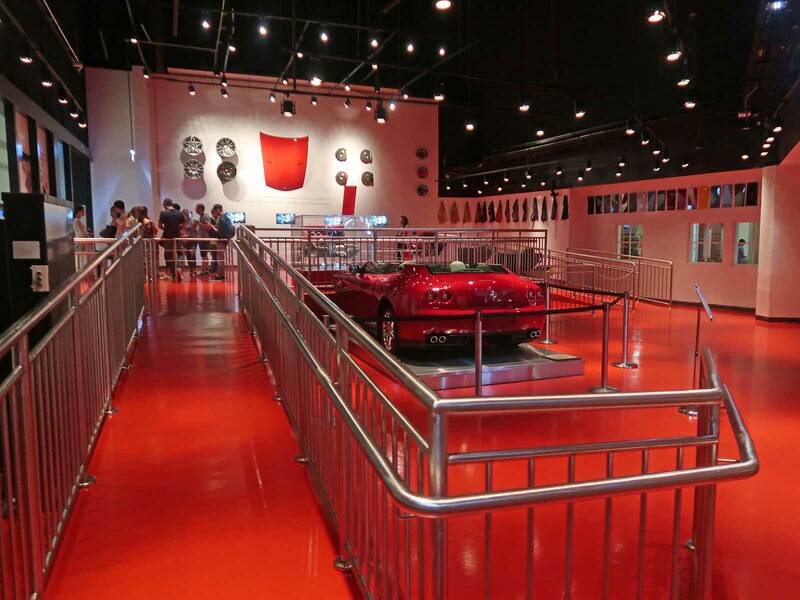 The next best option was Made in Maranello, a dark ride tour through the Ferrari factory. This attraction could have been produced at a drastically lower cost by installing a static theatre; though there were small areas of dark ride scenery the vast majority of time was spent moving between different cinema screens. The one memorable thing for us was seeing a ride operator reprimand a group of would-be queue jumpers, which earned him both an on-the-spot compliment from us and a handwritten thank you note at guest services. The only coaster we'd yet to experience at this point was Fiorano GT Challenge, a twin-tracked family ride that attempts to simulate the experience of racing using a mixture of launch segments and brakes. The ride wasn't outstanding when new, and time hasn't improved it; the tracking at this point has become quite rough, and the regular brake segments result in very uneven pacing. We did one lap on each track as there was no queue at all, and both were missable, to the point that we may well choose to skip them entirely on our next visit to the park. Our normally helpful GPS refused to navigate us from Ferrari World Abu Dhabi to Motiongate, as a number of roads near the destination were missing from its database. It was tempting to switch to off-road mode, as our rental car was well suited to the task, but it would have taken too long. Instead we followed signs for Dubai, and in due course ended up on Sheikh Zayed Road from where Dubai Parks & Resorts was clearly signposted. The drive took a little less than an hour, followed by a short tram ride from the parking area to the park itself. Our friend Dave was waiting for us at the entrance. 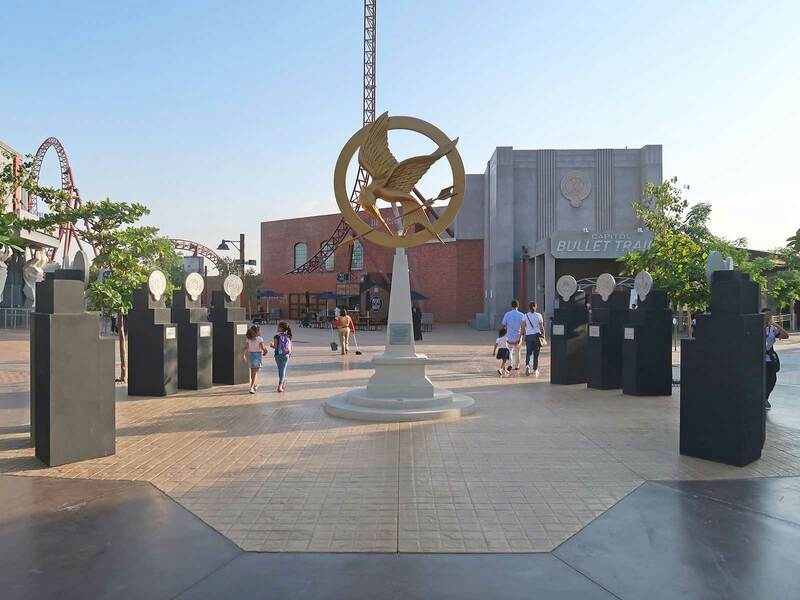 The decision to go back to Motiongate less than a year after our last visit was triggered by the opening of a new land themed to The Hunger Games, a series that I'm rather fond of (and not just because of a certain American actress, I promise). The area is anchored by Capitol Bullet Train (#2399), a Mack launched coaster that we'd seen under construction during our visit in January. At the time it looked like the ride would be a launched shuttle, an impression reinforced by a prominent reverse spike visible under scaffolding, though it has since become clear that the layout is in fact a full circuit with a forward-backward-forward launch system identical to that seen on Star Trek: Operation Enterprise at Movie Park Germany. A sliding launch track allows two trains to be operated at the same time, though only one was in service today (which, to be fair, was all that was needed). The ride has a mandatory locker policy using the same system seen in the Six Flags Parks, though in a pleasant change from the norm these are offered free of charge. The rental terminal requires users to pick a four digit PIN which has to be entered twice, the second time on a scrambled keypad for additional security, after which a printed receipt is issued. In a surprising move the newly assigned locker doesn't open automatically; instead, the PIN is needed for the third time in less than a minute (which presumably reduces the number of forgotten codes). Instructions are provided for ending the rental too, and though we tried pressing the designated button it didn't appear to have any effect. The queue entrance is through a stark grey building adorned with signage for District 12, home to Katniss Everdeen and Peeta Mellark. The interior has quite a bit of cattle grid (which was not in use today) as well as a replica of the side windows of one of the train cars depicted in the movie. There are other interesting props too, not least a static model of a peacekeeper and a Kuka-branded robot arm (albeit without the seats so beloved of the enthusiast community). The boarding platform is one level up; for our first ride guests were being held at the base of a flight of stairs and sent upwards one train load at a time, though this stopped later on in the day after the park emptied out. The layout has three distinct highlights. The first is the reverse spike, which delivers a fantastic sensation of weightlessness that is best for those sitting in the back of the train. The second is the vertical loop immediately after the launch track which the train traverses remarkably slowly, giving a few seconds of hang time. The third and finest moment, good in both front and back, is a wicked airtime hill and direction change from right to left that is surprisingly forceful even for those who know it is coming. These elements combine to deliver an overall package that is very good indeed, though it would be remiss of me not to record a continuous rattle throughout the course that was more than a little surprising on a ride that has been open for less than a month. Over the course of the day we managed four laps, and for me at least that was all that I really wanted. The other new attraction in the Hunger Games area is Panem Aerial Tour, a simulator ride manufactured by British company Holovis that can be thought of as a close relation of the Star Tours rides in the Disney parks. As with the nearby coaster the theming begins at the entrance to the queue, in this case with a bouquet of white roses that is immediately recognisable to fans of the series. The pathway then continues into the Hall of Heroes, a room decorated with lifesize portraits of victors as portrayed in the movies, and into a second room decorated with posters showing off the different products from the various districts of Panem and assorted futuristic theming. A length if somewhat forgettable pre-show starring the inimitable Effie Trinket prefixes the main event, which takes place in one of two thirty-seat motion theatres. The main video, watched through 3D glasses, begins with around fifteen seconds of flight over scenic woodland. The pilot then announces a rapid launch forward to the outskirts of the capital, an imagined postmodern city filled with skyscrapers along the banks of a clear blue river. The tour follows a graceful path for a bit until the inevitable disaster strikes and passengers end up caught up in the middle of a gun fight. The journey from that point onwards is lively, though it's worth noting that the motions remain comfortable at all times, a definite improvement over earlier generation rides of this type. 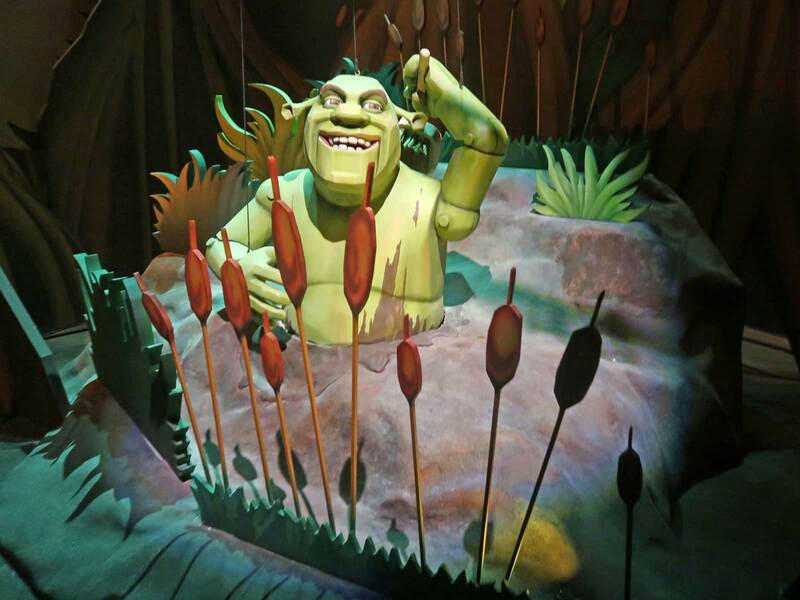 With the outdoor attractions completed we made our way into the Dreamworks building where we found Shrek's Merry Fairy Tale Journey, a lengthy trackless dark ride that recounts the story of the first movie using marionettes and projections in place of the more usual animatronics. This approach was refreshingly novel in a world where dark rides share a lot of the same characteristics, and it worked very well indeed, so much so that we went for a second ride later in the day. The only slight negative for me was that the cars followed a very clearly defined route with only two points where the lack of a guide rail made any difference to the layout; I'd have liked to have seen a bit more variability. Our next stop was at Dragon Gliders, a Mack Inverted Powered Coaster that we'd seen under construction during our visit in January. It was quite a surprise to see a forty minute queue in a virtually empty park, but it quickly became evident that the root cause was capacity, as only two twelve-seat vehicles were in use today and one row of four was out of service, giving a best case capacity of three hundred per hour, about a fifth of that found on Arthur at Europa Park. The throughput was limited further by the fact that the ride has a continuous loading system with a narrow window before restraints have to be locked to avoid an automatic shutdown; guests arguing over who should sit where caused at least two trains to go out empty while we queued. As with its German cousin the ride is more dark ride than coaster, with most of the layout being a low speed journey blended between animatronic scenery and projections. Once again there were three key points in the ride for me. The first involved the cars coming to a silent halt in complete darkness for just long enough to make me wonder whether there had been a power failure. The second involved a projection where a sneezing dragon on screen was synchronised with a water splash effect. The third was towards the end of the layout where the cars finally pick up a little speed for a journey around the perimeter of the area themed to How to Train Your Dragon. (During the course of our visit the third word of that title was corrupted into drain, changing a family friendly title into something that would definitely not pass the censors in the Middle East. Jennifer Lopez made the same mistake at one point; I wonder what she was thinking of). The overall quality of the ride was excellent, though it definitely doesn't feel like a coaster. We had hoped to ride Kung Fu Panda: Unstoppable Awesomeness, but sadly it was out of service for the day, leaving us with one final ride on our hit list. We had been told during our visit in January that the interior theming on Madagascar Mad Pursuit was still in progress, and we were eager to see the finished product. Unfortunately this proved throughly anticlimactic. The queue, station, and track section prior to the launch looked great, but the rest of the layout was taken in near blackness with only occasional sparse visual effects. Worse yet, the comfort level was reduced somewhat over what it had been earlier in the year, with the sharp left immediately after the launch bordering on violent. I found myself very grateful for the lap bar restraint; an overhead harness for that turn would not have been fun at all.